Asus is celebrating the 10th year of its Republic of Gamers (ROG) division with a new flagship motherboard based on Intel's X99 chipset. 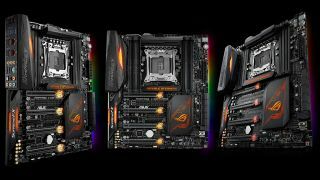 It's the ROG Rampage V Edition 10, a decked board for Haswell-E and Broadwell-E processors that's already set three world records and 14 global first place finishes in 2D and 3D benchmarks, Asus says. If it's bling you're after, the ROG Rampage V Edition 10 brings it by way of a sleek layout and Aura RGB illumination. There are five independently controlled LED areas on the motherboard, plus a 4-pin RGB header for add-on RGB strips if you want to crank the light show up a notch. Behind the bling are plenty of high end features, including eight DIMM slots supporting up to 128GB of DDR4-3333 (OC) RAM and four PCI Express 3.0/2.0 x16 slots for up to four-way SLI or CrossFireX setups. For storage chores, the board provides 10 SATA 6Gbps ports, along with both M.2 and U.2 connectors for PCIe-based SSDs. The board isn't light on USB ports, either. It boasts two USB 3.1 Type-A ports, two USB 3.1 Type-C ports, eight USB 3.0 ports, and six USB 2.0 ports. Connectivity continues with onboard 802.11ac Wi-Fi (3x3) and dual Ethernet controllers, both from Intel (1219-V and 1211-AT). Throw onboard audio into the mix and you're looking at a ton of rear I/O ports, though you won't have to worry about fiddling with an I/O shield—they're all pre-mounted to make motherboard installation a little bit easier. The rear I/O is also where the clear CMOS and reset buttons are located. This is a motherboard that's designed to push the limits with extreme overclocking. To make that possible, Asus uses high end components in its construction, along with a custom designed PWM controller. It even has a dedicated water pump header with support for high amp fans up to 3A. Asus didn't mention in its press release when the ROG Rampage V Edition 10 will be available or for how much, though according to WCCFTech, it will debut soon for $599.